The fifth season of The Walking Dead has employed flashbacks a little more regularly than in prior seasons. We saw it with Gareth to learn a bit about how they came to revert to cannibalism (sort of), and this week we see it with Abraham to learn a little about his mindset and his drive to get Eugene to DC. The first of those 4-5 flashbacks comes at a rather unexpected time, just after the bus they were driving crashes. After that they become a regular method of returning from commercial break. I thought they added a lot of value to the episode and gave us a side of Abraham we hadn’t yet seen. 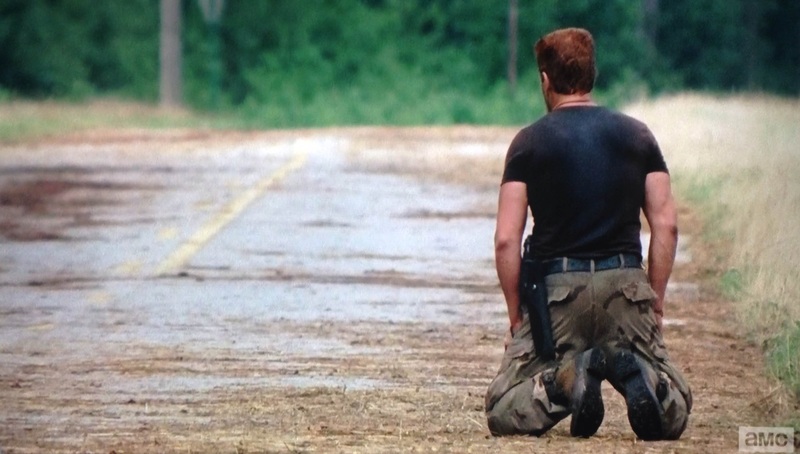 In the first couple flashbacks a wound is opened in Abraham, both a physical and an emotional wound, that both return at the end of the episode. While still on the bus the conversation turns to Eugene’s mullet, because why wouldn’t it, and Tara asks him if it’s the source of his power. She’s teasing him a bit, but in typical Eugene disconnect, he relates that immediately to the Biblical Samson. A Nazarite, Samson’s long hair (part of his vow to God) was the source of his superhuman strength. 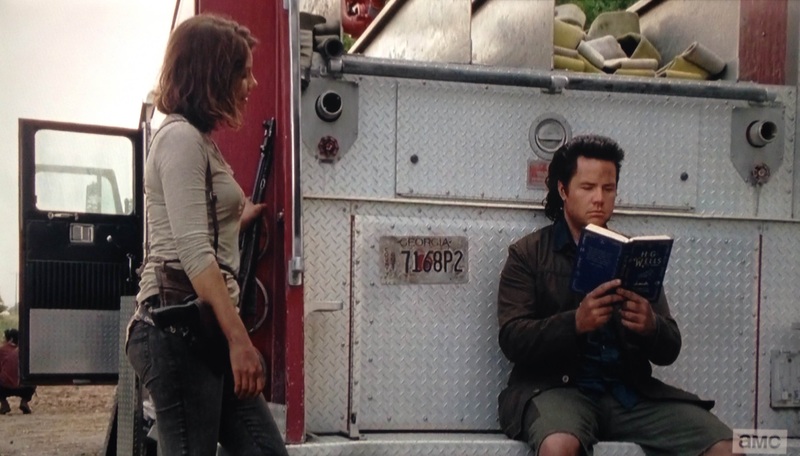 Obviously Eugene doesn’t quite measure up in the strength aspect, but Maggie had an interesting insight later on. Rather than focusing on Samson’s strength, she keys in on a riddle he once told (Judges 14:14). A riddle which was basically unanswerable, because the answer only exists in his own experience and in his mind. This is a very interesting parallel to be ascribing to Eugene. Readers of the comics know that Eugene has been lying through his teeth about having the cure. With show-runner Scott Gimple promising audiences they will be getting back to some of the storylines in the comics, it was pretty much guaranteed that Eugene was being deceptive. Making the parallel with Samson was a cool connection because Eugene was telling a story and setting up a scenario that existed only in his mind as well. It’s not everyday you hear a comparison to Samson focusing on something other than his strength. Leave it to Hershell’s daughter though to come through for us! Most of the episode is pretty even paced. There aren’t any major highs or lows. You have a couple walker attacks but nothing very worrisome. You have Eugene revealing to Tara that he sabotaged the bus to slow them down. You almost think he’ll spill the beans right then. She’s surprisingly protective of his secret, which makes me wonder why this trust between them couldn’t have been played out a little more to make Eugene’s secret about the cure last a bit longer. Seems to me there is a lot more they could’ve gotten out of that. Earlier on the bus you have Maggie and Glenn questioning Eugene a bit about the cure. Again, a lot more to work with there. But the culmination of this all and what the flashbacks are working us toward is Eugene’s reveal and the impact of it on Abraham. There is an interesting choice in this episode on which character to focus on. For being the episode where they finally reveal Eugene’s secret, they do everything they can to make this not about Eugene. That’s a bit of a tip as to how un-interesting he is outside of this secret. Instead it’s used as a chance to explore Abraham a bit. What makes him tick. The family he is with and finds dead in the flashbacks is his own family. We see him dropping to his knees in despair and disbelief as he learns of Eugene’s lies. Then we see him ready to end his life, kneeling by his dead wife in the final flashback. Two very powerful moments in his life, each connected by feelings of abandonment, betrayal and failure. When Abraham lost his family, Eugene’s mission gave him purpose and direction. The mission saved him. Now knowing that was all a lie, what does he have? Our secondary group is left with an emotionally distraught Abraham, no hope of finding a cure and stuck in the middle of the road with a broken down fire engine. Not a good place to be. I really liked the emotional depth the episode reached with Abraham. The flashbacks were short and sweet but eventually came full circle to add some important meaning to the current situation. We witness his emotional highs and lows and Cudlis does a terrific job conveying all of it. The injury to his hand that never quite heals and finally opens back up completely by the end is a great visual to what Abraham experiences emotionally. What I didn’t like is all the missed opportunities with Eugene’s reveal so early in the season. During his confession, he lists off names of those who died protecting him. Like that was baggage he had been carrying around this whole time that really weighed him down. But we never got to see that effect on him. He confided in Tara a bit, let’s continue that and reveal more and more, all while watching others become more curious of him or seeing him actually care if someone dies for him. So many chances missed. Eugene got punched pretty hard, but no way he’s dead. Abraham on the other hand is a cracked nut. He could take off on his own or kill the next person that talks to him. My guess is he regroups, gets his mind right and continues leading this group to wherever they’re going next. He had nobody to protect last time he broke down, but he does now. But where will he lead them? Seems to me they either continue to DC or go back to the church. I think Glenn and Maggie lobby hard for the latter and they head back to the church. Unfortunately they get there too late and everyone has left for the hospital already. Eugene’s reveal really changes the game for this group. Abraham is shaken, group trust overall has taken a hit. I think poor decision-making causes one member of Abraham’s group to die before they make it back to the church. My money’s on Eugene or Rosita. 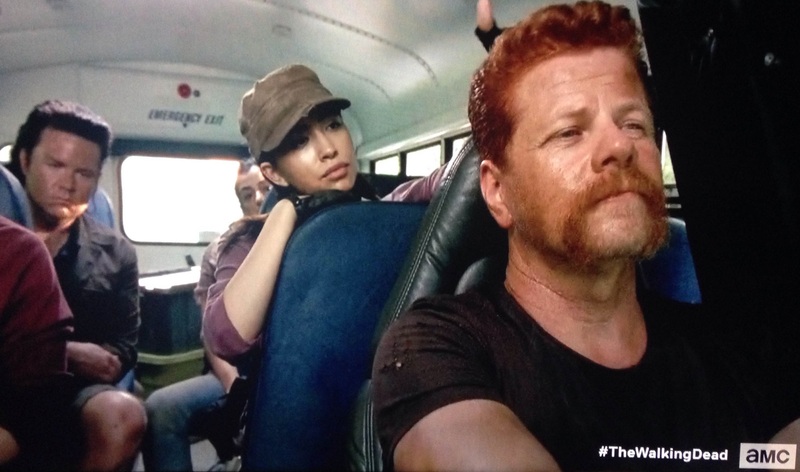 I’ve thought Rosita was pretty expendable for a while now, but that’s a lot to lay on Abraham in his fragile state. So I’ll stick with an either/or prediction here. Abraham and Eugene both came to a revelation that I think will help them become stronger survivors in the long run. Eugene doesn’t need to hold onto the lie anymore, knowing that people will care and protect him as he is, not the person with the cure. I also liked how Eugene water hosed those walkers, proving his worth to the group that had nothing to do with the “cure”. Abraham went berserk at the end but I think he’ll come around. His single -minded pursuit to get Eugene to DC was putting his people in danger and now that the secret is revealed, hopefully he’ll being to think more clearly and find a new purpose. He still has anger management issues though lol. While not my favorite, “Self Help” is a solid episode, and just 2 more to go before the mid-season finale. I am curious how much Eugene will be cared for now. I know Tara said that after he told her he sabatoged the bus, but I have a hard time believing Abraham and Rosita will feel the same. He certainly won’t get the protection he used to. I also think Abraham will come around. He had nothing before when he almost killed himself. Now he has a group he’s with and somewhat feels responsible for. I wonder how Rick would’ve reacted had Eugene revealed his lie to him… would he get “Carol’d”? (kicked out of the group). So we have two cliffhangers to resolve (Carol’s status and Daryl’s companion in the woods) and one small group mission to re-establish. Good place to be for the show I think. Thanks for commenting!